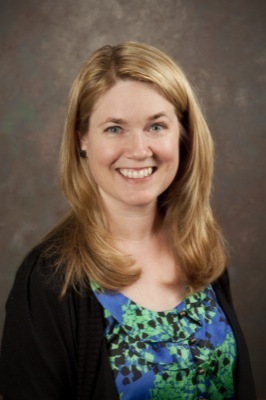 11:33 a.m., Nov. 13, 2013--The Association of Mathematics Teacher Educators (AMTE) has announced that Amanda Jansen, associate professor in the University of Delaware’s School of Education, is the recipient of the 2014 AMTE Early Career Award. AMTE is the largest professional organization devoted to the improvement of mathematics teacher education in grades K-12. Its early career award recognizes a mathematics teacher educator who has made distinguished contributions and shows exceptional potential for leadership in mathematics teacher education within the first 10 years of their career. Jansen will be honored with the award during the 18th annual AMTE Conference in Irvine, Calif., in February 2014. Jansen was nominated by her colleague, Jim Hiebert, Robert J. Barkley Professor of Educational Development in the School of Education. In his letter of nomination, Hiebert described three important contributions from Jansen -- her important role in developing UD’s K-8 mathematics teacher education program, her use of innovative teaching methods such as the dual number line representations as a new approach to teaching pre-service teachers about division with fractions, and her collaboration with Alfinio Flores, Hollowell Professor of Mathematics Education, to develop an innovative mathematics course for mathematics education doctoral students. Jansen engages in continuous improvement of instruction in mathematics teacher education through collaborative research and development with her colleagues and Ph.D. students. Her peers appreciated her as a teacher and were struck by her willingness to think with them about their work and to help them move forward. Her doctoral students reported seeing her as a role model whose professional life they would like to emulate. James Middleton, professor at Arizona State University who co-authored a book for mathematics teachers with Jansen titled Motivation Matters and Interest Counts: Fostering Engagement in Mathematics, supported her nomination with a letter that lauded Jansen’s excellent record of publications in top-tier journals. Jansen said she believes the award reflects the excellence of her colleagues -- Hiebert, along with Anne Morris, professor of education; Dawn Berk, assistant professor; Charles Hohensee, assistant professor; and Brad Glass, assistant professor.